Biotrue solution conditions, cleans, removes protein, disinfects, rinses and stores soft contact lenses including silicone hydrogel contact lenses. Biotrue multi-purpose solution cushions and rehydrates lenses for comfortable wear. 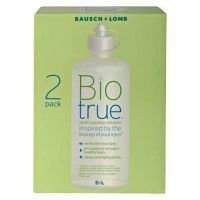 By keeping lenses hydrated, Biotrue multi-purpose solution makes wearing contact lenses comfortable all day.